Help Luck Family Chef Ben Stephanou get a new truck! 100% of proceeds from direct donation will go toward Ben's truck. If you've been an artist or crew member for Luck Reunion over the years, you've probably met the always smiling and always shining chef smoking salmon, roasting lamb, and rolling sushi backstage at our events. Ben Stephanou has been a part of the Luck Family since year 2, and serves our artists and crew far beyond Luck...running catering backstage at the Moody Theater. Ben also has a huge heart. 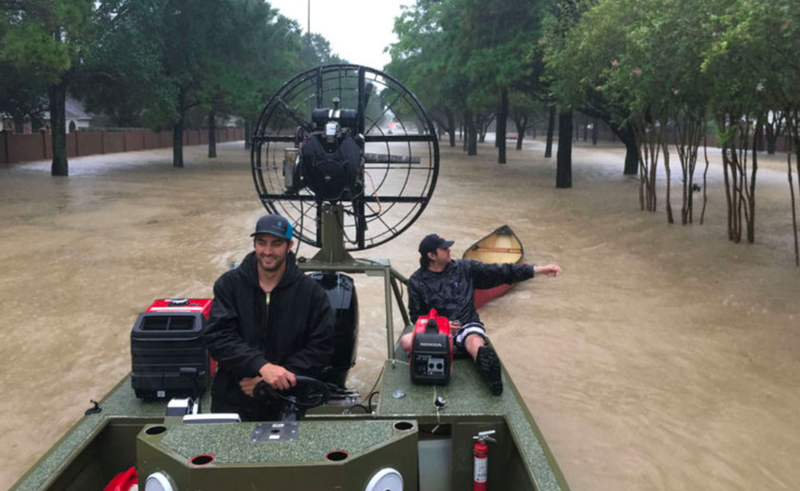 When he saw his home town of Houston, TX being hit with Hurricane Harvey flooding, he packed up his truck and set out to take part in the rescue efforts. Sadly, Ben's truck, which he uses to tow his catering trailer and for his everyday work, was flooded in the process. But that didn't stop Ben. He stayed and joined an Odessa man he met at a gas station in rescuing folks in an air boat. (That's Ben in the back of the boat...lookin' good). As Ben continues his selfless mission in Houston, help us help him get a new truck so he can get back to work making delicious food for the Musicians of Texas!